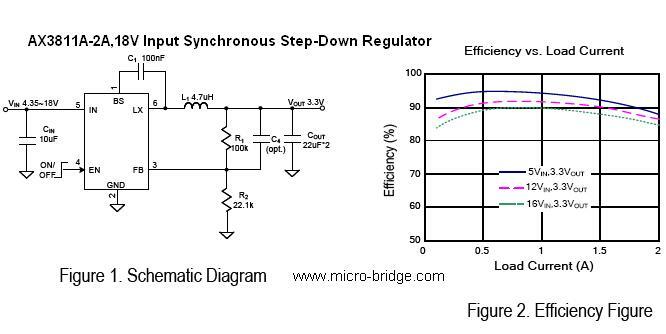 AX3811A develops high efficiency synchronous stepdown DC-DC converter capable of delivering 2A load current. AX3811A operates over a wide input voltage range from 4.35V to 18V and integrates main switch and synchronous switch with very low RDS(ON) to minimize the conduction loss. AX3811A adopts the instant PWM architecture to achieve fast transient responses for high step down applications and high efficiency at light loads. In addition, it operates at pseudo-constant frequency of 500 kHz under heavy load conditions to minimize the size of inductor and capacitor.